Here are some tips for buying toys for kittens. 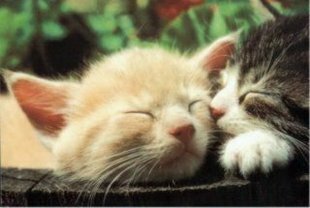 If you have just brought home a new kitten then you know how playful and fun they can be. Kittens love to play. They enjoy pretending to stalk various objects, pounce on them and then attack with all their kitten energy. You have probably noticed that there are all sorts of cat toys for sale. While you may decide to purchase any of these for your full-grown cat, you will need to be more selective when choosing playthings or toys for kittens. You don’t want to test the 9 lives theory if you can avoid it. Your kitten may be thrilled at the idea of playing with a piece of string, paper clip or ribbon. While their play is cute, these items can be very dangerous to them. A kitten very much like a human baby will put almost anything in its mouth. Strings and ribbons when swallowed can tangle up in the digestive tract and make the little fellow very ill. There are many stories from website visitors posted on the cat blog about expensive vet visits stemming from the swallowing of foreign objects. Some people might think that it is cruel to take fun things away from the new kitten. But being a parent to a curious kitty often requires tough love to prevent harm from coming to them. Select safe toys for kittens like a fishing pole style toy. These items include a plastic pole with a heavy-duty string tied to it. The other end of the string is usually anchored to a fuzzy mouse, a ball, a feather, or any other of a number of small but safe playthings. These toys are a great way to interact with the new kitten. 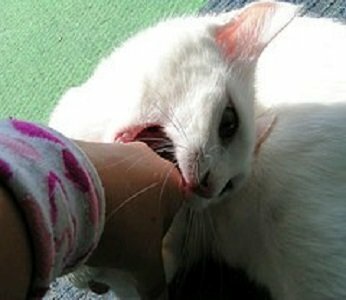 Although it is downright cute when the tiny feline pounces on your hand and bites or kicks, this is not behavior you want to encourage.Now is the time to teach your pet about not biting the hand that feeds you. Tiny kitty teeth don’t hurt as much now, but when that young one grows up, you will be facing a big problem. It is best never to condone aggression in a pet, even if it is play aggression. Choose instead a remote control or battery-operated mouse. The kitten will enjoy the thrill of chasing and attacking a moving thing. Just make sure always to supervise kitty when he is playing. Small household objects may be very appealing to a kitten. Again string, ribbon, a button, balled up piece of paper, bits of packaging or other small items could become very dangerous if swallowed. Choose instead small stuffed animals, balls, or fuzzy mice for the kitten to play with. These small items make excellent items for the kitten to attack. Remember that these toys are made especially for cats, they do not include hard objects, like buttons, that can be dangerous. When you bring home a new kitten they are most likely going to see everything as a possible play toy. You will need to teach the kitten what is safe and what isn’t. What’s for play and what is completely off-limits due to health or safety reasons. You’ll have to devote extra time and effort especially in the beginning, to make sure your kitten never tries to swallow any toys. This includes specialized made for cat toys. Avoid anything with loose strings, ribbons, or cords since they can be dangerous and could lead to the kitten chewing on an electrical cord. Since your kitten needs to be supervised, you’ll find this is the perfect opportunity to interact with them and play together. This will help with imprinting and build a strong bond between you and the new kitten. It also allows you the chance to teach him what is okay to play with and what is not. As I mentioned above many site visitors have experienced large vet bills before they could teach there kittens right from wrong. For this reason alone you may want to consider health insurance. Bookmark this cat toy page or share with a lucky friend with kittens.